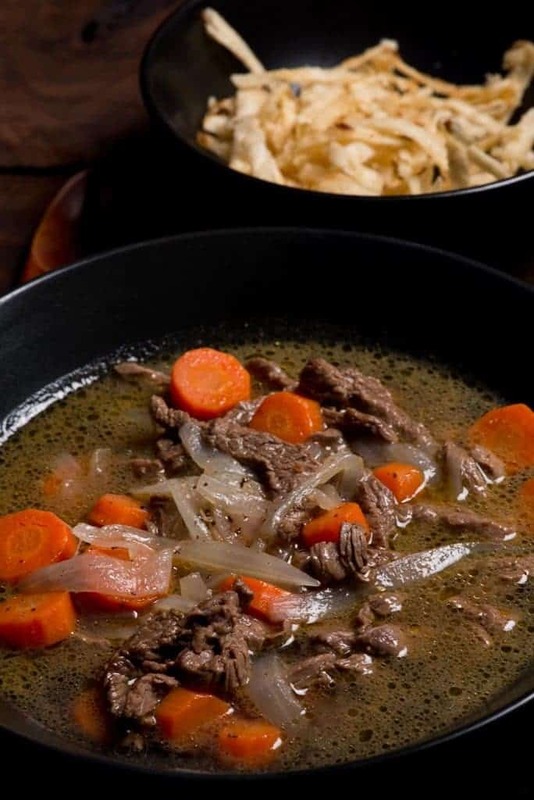 Mongolian soup called Guriltai shul is a meat based soup that gets its flavor from the meat and a few vegetables. The soup is topped with tasalsan Guril or fried noodles which adds a great texture to the soup. When I come across these recipes that are so basic, I wonder what it the point and then I eat it and totally get the point. It is simple, easy too make and absolutely delicious! Vegetables are not easy to come by in Mongolia however this recipes calls for onions and carrots. I am sure this is a treasured comfort food in the cold winter months in Mongolia. Just imagine yourself in a ger in the midst of alpine meadows and snow capped peaks, Enjoy! In a pot, saute the onions and carrots in a little oil, cook until onions turn translucent and carrots are bit soft. Add enough water so that it covers the meat and vegetables by an inch or so.